When it comes to working out, most of us require a little motivation to get going. For many of us, our music is what gets us pumped up to push through a strenuous workout. If you are on the market for headphones, you will likely soon feel overwhelmed by the hundreds of options that are out there. There are tons of headphones available for casual listening. When you are looking for headphones specifically to use while working out, however, you will need to educate yourself on what features to look for. Buying the wrong headphones can literally ruin your workout so you want to find the best ones. It can be annoying when you keep getting tangled in the wires of your headphones while exercising. This is why wireless Bluetooth headphones are great to use for working out. In this article we will talk about the different types of wireless headphones, the best ones on the market right now, and the most important features the best workout headphones should have. The 8mm speakers combined with Bluetooth 4.1 technology produce a HD sound with a powerful bass. The Phraiser BHS-730 Earbuds deliver clear accuracy for highs, mids, and lows. The bullet-shaped tips are made of memory foam which makes them comfortable to wear and also blocks out external noises. Unlike traditional earbuds, these ones come with patented winged earphone tips so they will stay put while you are working out. If you want an even more secure fit, use the included over-ear or under-ear hooks. Both earbuds have built-in magnets so you can conveniently where them around your neck when you aren’t using them. When you want to use them again, no need to go searching through your pockets or bag. The Liquipel coating on the earbuds makes them completely sweat proof. Phaiser is so confident in their product that they offer a Lifetime Sweat proof Warranty and will replace your earbuds if they get damaged by sweat. Although these are not to be used for swimming, they can be dropped in water and still function just fine. To make them even more durable, the earbuds are made of Aviation Grade Aluminum-Magnesium-Alloy which makes them sturdy without adding weight. When you need to take a call, just use the built-in microphone to talk hands-free without interrupting your workout. The rechargeable battery will charge in an hour and then you can enjoy your music for 5-6 hours. To check how much battery is left, simply use the Life State technology on your Android or iOS device. Using Bluetooth V4 1+CSR technology, these BLAYZ Sports Earbuds deliver an excellent HD sound with a deep bass. Connect quickly to all Bluetooth devices from a range of up to 30-feet. With noise-reduction technology, you can enjoy your music without hearing outside noises. The ergonomic designed ear hooks fit naturally to your ear so that you can wear them comfortably for an extended period of time.They come with different sizes of ear buds to provide the best fit for you so that they will stay put in your ear. The ear hooks and tips are made of a soft, light-weight silicone gel for comfort. These BLAYZ Sports Earbuds are waterproof with an IPX7 water- resistance rating. Fully charged, the battery will give you up to 8-hours of playback time. After a quick 15-minute charge, the battery will last up to 1 hour. They also feature a real-time battery indicator for iOS devices. These earbuds have a built-in microphone and provide excellent sound quality for phone conversations. There are controls on the earbuds to adjust the volume so that you don’t have to reach for your phone. Along with the earbuds themselves, you will also get a 1-meter long micro USB cable and a dual USB high-capacity car charger. 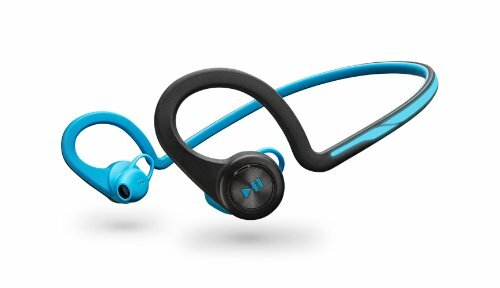 The powerful speakers of the Plantronics Back Beat Fit Bluetooth Headphones deliver clear highs and that deep, powerful bass that you love. While the design enables you to hear your music clearly, they are also designed so that you can hear your surroundings. This makes them safer for outdoor use. 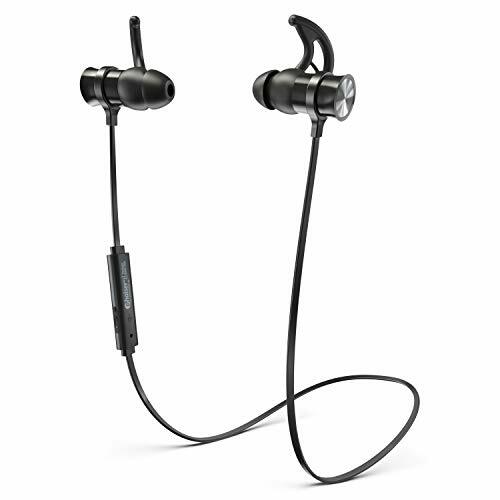 The on-ear controls allow you to easily control music and incoming calls.The flexible design makes these earbuds comfortable to wear and it also makes them stay put in your ears during a workout. With an IP57 rating, they are built to be sweat proof. During manufacturing, a protective Nano-coating is applied to the earbuds, making them liquid repellent. The battery will give you up to 6-hours of talking time and up to 8 hours of playback time. Using the headset battery meter that automatically displays on iPhones and iPads, you can easily keep track of the battery life. When the battery is getting low, an alert will come up on the screen. When the headphones are away from your phone, the Deep Sleep hibernation mode will kick in to extend the battery life. You can use a free smartphone app to wirelessly update your BackBeat Fit Earbuds. Along with the headphones you will also receive a smartphone armband, micro USB charging cable, and a start guide. Featuring the latest Bluetooth 4.1 CSR technology, these earbuds guarantee to deliver a clear treble and a deep bass sound. They also feature noise-cancelling technology so you can work out in peace and not be disturbed by outside noises. 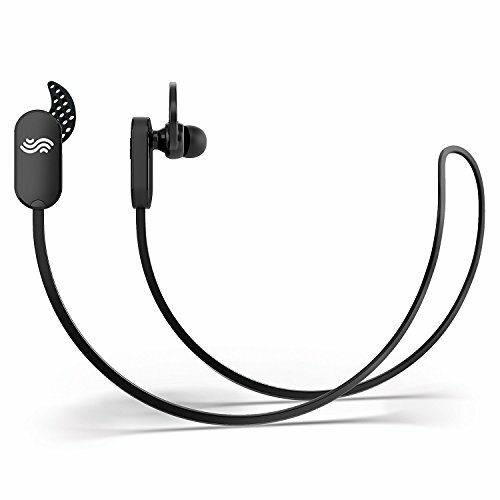 The silicone earbuds are built for comfort and ear hooks ensure that they will stay put during exercise.The headphones connect in a flash to all Bluetooth devices. To fully charge only takes 2-hours and then you can enjoy up to 9-hours of playing time. Music controls are located on the headphones. When you need to take a call, just use the built-in microphone. Tribe is pretty confident in this product since they offer a lifetime warranty to replace them or give you a refund if don’t absolutely love these TRB Headphones. Using CSR sound chip technology,these headphones deliver a clear, crisp sound with no distortion.To keep the headphones in place, they come with silicone stability loops. A built-in microphone uses CVC 6.0 noise reduction technology to ensure clear phone conversations. The controls on the headphones allow you to easily control your music as well as take calls without having to dig out your device. The lithium-ion battery will give you up to 8-hours of listening time. 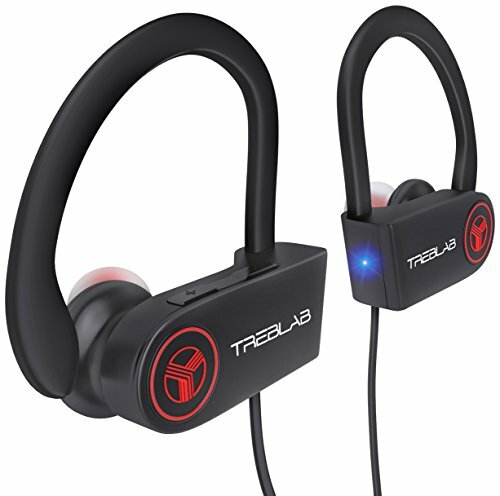 These are a great budget option for workout headphones. Before you start shopping for headphones, you first need to decide which kind you want to buy. There are several types to choose from and we have broken them down for you. These types of headphones are designed to sit on the outer ear. Over-the- ear headphones are different in that they cover the entire ear. 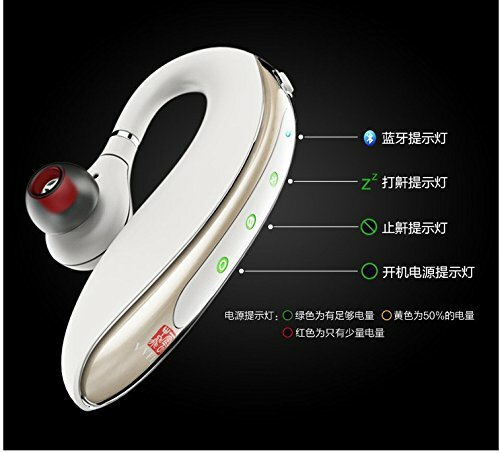 On-ear headphones are lighter and cause less strain to the neck. Since they don’t provide a seal like other types of headphones, they aren’t the best for sound quality. You will still hear outside noises and the bass will sound muddy. Sound easily leaks out from these headphones so people near to you will hear your music. Over-the- ear headphones are much better for sound quality but because of their large size, they are not ideal for working out. Some people prefer on-ear headphones because they don’t like sticking earbuds in their ears. Some find on-ear types more comfortable. 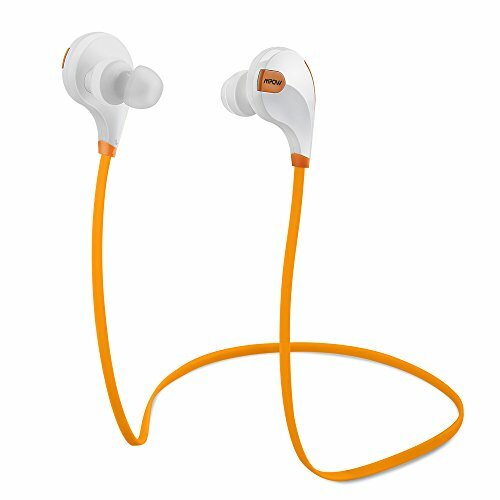 In-ear headphones are one of the most popular types of headphones, especially for working out. Since they have a snug fit inside the ear canals, they provide a great seal. While very loud noises might be audible while wearing these, you will not be able to hear normal outside noise. Higher-end models can deliver better sound quality than larger headphones. The tips are different sizes and usually made of foam or silicone. Some tips on higher-grade models can even be custom made to fit your ears. Since this type seals your ear canal, they stay put even during rigorous exercising. In-ear headphones are the most popular type of headphones these days for music lovers. Although there are some pricey options, there are cheaper options as well. Everyone has probably owned some earbuds at some point in their life. Earbuds surged to popularity because the other alternative was the big, bulky earphones.They are small, lightweight, and easily portable. They come with most music devices. They are different from in-ear headphones in that they sit on the outer ridge of the ear. Traditional earbuds don’t provide a seal on the ear and offer lower sound quality. Outside noise is easily heard while using these. If you have ever used earbuds, you probably found yourself constantly readjusting them to get them to stop falling out of your ears. Not long after wearing them,you realized just how uncomfortable they are. Thankfully for us, manufacturers have fixed the common problems that traditional earbuds have. 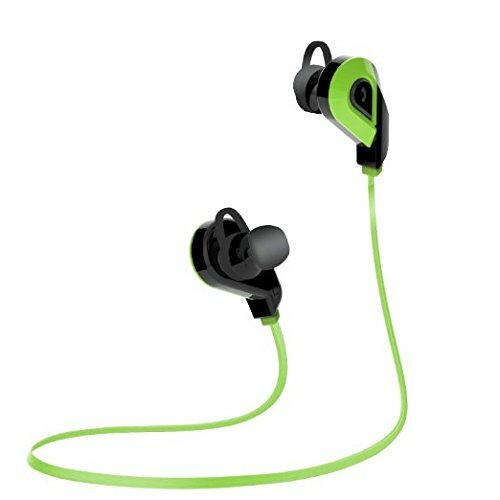 There are earbuds that have been designed specifically for working out so they are durable, comfortable, and stay put in your ears. The sound quality has been improved there are even many wireless options. This is of top priority since you will be wearing the headphones during rigorous activity. You don’t want to keep stopping to reposition the headphones. Be sure they fit snugly and comfortably. Lighter ones are usually more comfortable. For earbuds, make sure that they have ear hooks or are designed in a special way so that they won’t fall out of your ears. Everyone knows that when you are exercising, you will be sweating a lot. Besides sweat, the headphones may also come into contact with splashes of water or splashes from your favorite energy drink. The best wireless headphones should be able to hold up under these circumstances. When you are all pumped up in the middle of a workout, you don’t want your motivational music to suddenly die. The best Bluetooth headphones should last at least 4 hours before needing to be recharged. Of course good sound quality is important, but also make sure that they are designed in a way so that others around you won’t be able to hear your music. This will give you more privacy. Headphones that block out all outside noises are great for indoor use. If you exercise outdoors, however, you will need to be able to hear your surroundings for safety reasons. Shopping for headphones can be overwhelming and exhausting. But when you know the right things to look for, finding the right ones will be a breeze. First, decide what kind of fit you want. Make sure they fit comfortably and securely in your ear. They should be durable enough to withstand extreme conditions. The best wireless headphones will have a good battery life, providing several hours of playing time. The sound quality should be good, producing a clear, crisp sound and a deep bass. Others around you should not be able to easily hear sound from your headphones. In a noisy gym, you will likely want to look for headphones that completely block out outside noises. In certain conditions,however, you will need to hear what is going on around you to stay safe. Instead of quickly grabbing the first pair of headphones you see, do a little research first to find the best headphones for working out. Great headphones will contribute to a better workout experience.